Perodua Bezza Limited Edition - all 50 units sold out! 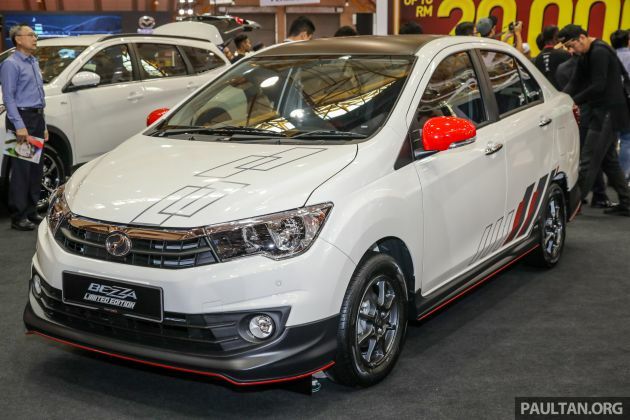 Home » Cars » Perodua Bezza Limited Edition – all 50 units sold out! Lo and behold, all 50 units of the Perodua Bezza Limited Edition that were exclusively on sale during the 2019 Malaysia Autoshow have been sold. The special model was based on the Bezza 1.3 Premium X, but gets accessorised and priced at RM44,890. At RM3,000 more expensive than the 1.3 Premium X, the Bezza Limited Edition is finished in a matte black bodykit with red pinstripe, matte black rear spoiler, blacked-out roof, dark grey alloys, red wing mirror caps and geometric graphics on the bonnet and lower sides. It’s only available in the sole Ivory White paint. Inside, the Bezza LE comes with GearUp seat covers with new red stitching, red air vent surrounds and GearUp coil mats. On the mechanical side, things remain unchanged. It’s powered by a 1.3 litre Dual VVT-i engine that makes 94 hp and 121 Nm of torque, and it’s mated to a four-speed automatic transmission. Watch the video below to find out exactly what’s new with the Bezza Limited Edition. To know more about Perodua’s first ever sedan, you may read our in-depth review. You can also compare its equipment and specifications at CarBase.my. Those 50 owners made a smart choice. Ya. Even if P2 made it 5000 unit limits also will sold out easily kacang2. Yes, Bezza will soon be very rare. Better to get a Limited Edition and keep. Sure will have RV in a few years later. Correct! Those 50 owners are smart to pick the real Game Changer. I salute them! Syabas P2!! The Game Changing Perodua Bezza is like “Thanos”. Only one snap of a finger, half of Persona and Saga sales disappear and Game Over. Same goes to other Perodua models that took over half of each Proton Game Over models sales. How is this is Limited Edition??? Only can fool 50 suckers. The rest wizened up and not buy them. So limited to 50 units. Very smart this Bezza. Very nice if it comes with the touch screen infotainment system. Hopefully those 50 customers won’t change the appearance of it because what’s the point in buying a limited edition only to make it look different.. again. It’s like inception of a different bezza in an already a different bezza. Its acceptable if they only change the player and add windows tinting. You add some body kits and seat covers?? And you call this limited edition. I think if you go to body kit shop they can help you modify it to look way better than this and probably cost less then 3k. Its just a gimmick to help push sales further. Weh kenot brain la wehh… Limited edition like this derived from amateur designers yet sold out?! Advance variant is much2 worthy than this LE. In Malaysia, just slap on the “LE” label , and everything will sell like hot cakes….with extra pricing. Change abit on the car, slap on stickers, spray paint mirror with another colour…..and voila! LE instantly. Pretty dumb to buy this. I have two Bezzas. First one bought for 45k, second one at 35k. I’d be lying if I said these cars are anything more than utilitarian. They ride roughly, roll like boats in a tsunami, and have the comfort of a turnip. I like them but there’s really nothing much to love.